OnePlus just announced its wireless earbuds, the OnePlus Bullets. Priced at $69/EUR69/GBP69, the earbuds are magnetic and water- and sweat-resistant, making the the perfect companion for your workout. Snap them together, and they're off; unsnap them, and they turn on, as simple as that. What's more, doing that motion when paried with a OnePlus 6 or 5/5T will automatically pause the music. The automatic pause feature is backward-compatible with the company's previous flagships like the OnePlus 5 and 5T. The Bullets also have the necessary smarts - just like many others, the OnePlus Bullets support the Google Assistant. What's more important, however, is the fact that OnePlus has thrown in fast Dash charging. Charging the earbuds for merely 10 minutes will give you 5 hours of playback time, which is an extremely important feature for wireless earbuds. As far as audio quality goes, OnePlus says the Bullets support AptX and feature a so-called Energy Tube that reportedly aims to decrease distortion and provide a better auditory experience. 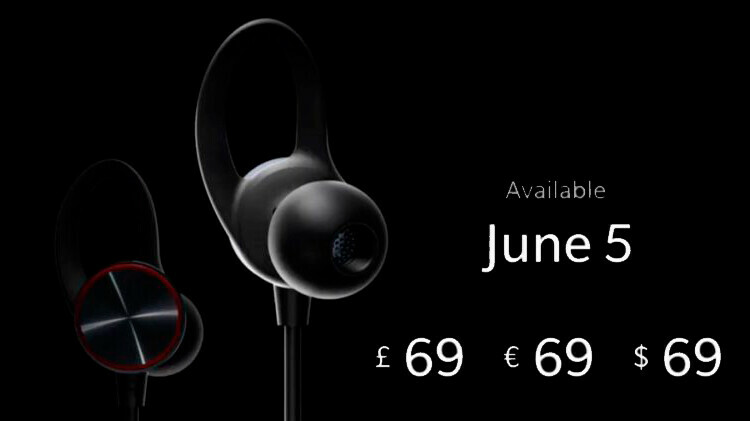 The earbuds will be available on June 5 alongside the OnePlus 6.
backward compatibility with op5t? do you mean it will not work with other smartphones? Those are bluetooth headphones ... They are "backwards" compatible with a washing machine - if it had bluetooth. 10 minutes of charging for 5h, but what is total time that I can hold on full charging?